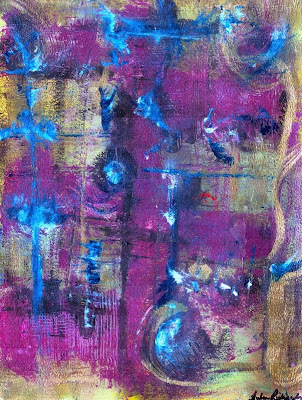 Acrylics on 11"x15" paper-Turquoise, violet/magenta, and bronze make this another addition to my late August, "A Painting a Day" series. Finished w/ a UV protective gloss varnish. Certified "Authentic" (COA) by Ebsq. This is another one...I not only love the colors, which are beautiful, but I also adore the movement!